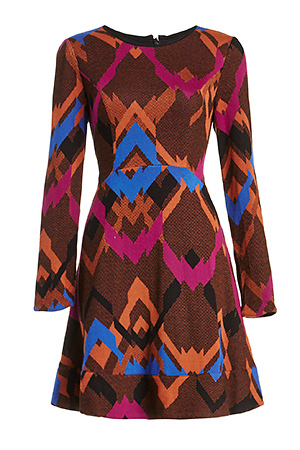 Update your office attire with our Chevron Fit & Flare Dress from Harlyn. This graphic number features long sleeves and concealed back zipper closure. Stylist Tip: Wear with a ballerina flat for a long day's work. Length: 34 in. Bust: 32 in. Waist: 28 in. Hip: 36 in. Sleeve: 24 in.